I'm a big fan of Pinboard (a bit like Delicious) as a way to bookmark things that I come across on the web and want to save for later and recently realised that I'd tagged more than 1000 pages since I joined the service. As a quick first step, I thought I'd look at whether my habits have changed over time - am I tagging stuff more on certain days of the week, hours of the day, months of the year? From this first analysis, there have definitely been a few lulls in my activity, notably around the beginning of 2010 and July and September of this year. I think most of these are likely due to holidays. The notable uplift in November of this year was due to making use of ifttt to automatically bookmark the tweets that I favourite. My tagging activity has also become more consistent across the week, moving from a Monday focus in 2010, to Sunday winning so far in 2011. At the same time, the difference between days has become far less pronounced in 2011. I've added a fair bit of interactivity to the chart, so that it's possible to see various cuts of the data - e.g. 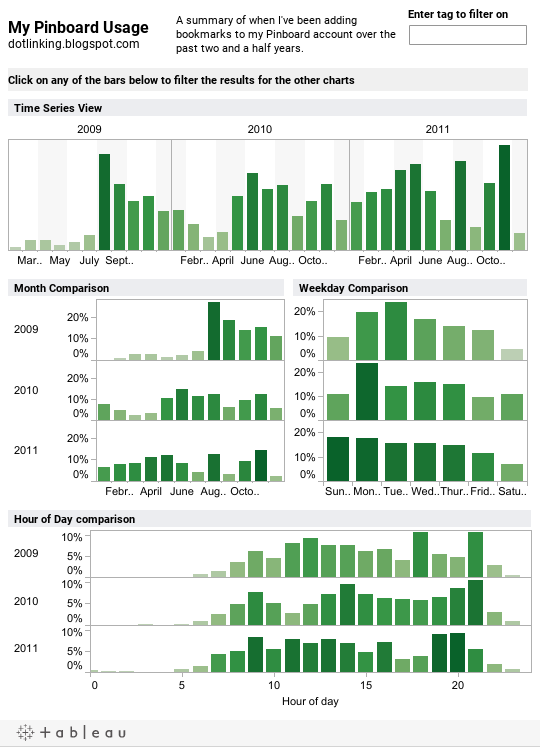 by clicking on Monday, it's possible to see how my tweets vary by hour of the day on Monday in each of the three years. If you're a Pinboard user and want to recreate this, I've put the R code that I used here, which creates a CSV file which you can plug in to the Tableau file and it should update for your usage. Note that you need to put your username and password into the R file to allow it to be authorised by Pinboard.